We’ve posted tons and tons and tons of interactive light shows and facade projections, but this recent installation in Auckland is hard to beat, for the elegance and flat-out fun-factor of the interface. 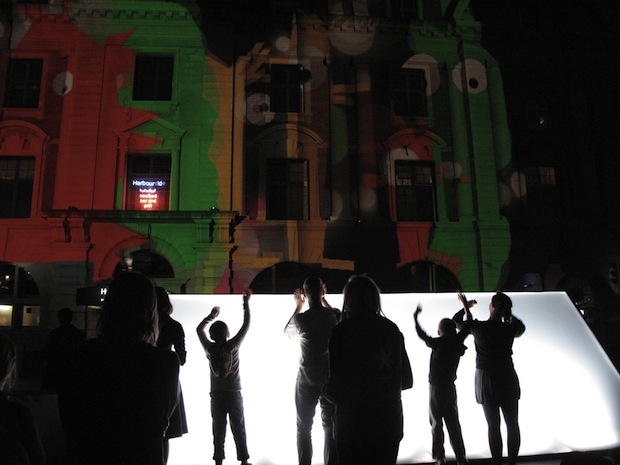 Created by YesYesNo with The Church, Inside Out Productions, and Electric Canvas, the installation turned the viewers into performers writ large, in a five-story projection upon the facade of Auckland’s Ferry Building. In all, there were three different modes of interaction: The stage (pictured above), a table capturing hand gestures, and a system for tracking the light emitted by people waving cell phones. There were also six animated themes, which cycled through every hour. How come this never happens in the U.S.? (One of the members of YesYesNo, Zach Lieberman, actually lives in Brooklyn, and collaborates with the Graffiti Research Lab.) And what is it with Australians (and now New Zealanders) and light shows?